Update 24 July 2006: Too NFBSK'n Hot! As you're probably aware, California is currently experiencing somewhat of a heat wave. In the areas where I live and work, many temperature records, going back as far as they could accurately measure ambient temperature, have been broken. Whooooeee, I sure am glad to be reassured that such unusual temperatures could not possibly be caused by human activity. Anyhow, for the last two weekends, it has been too hot to work at the shop. I do this stuff at least partly for fun, and I adamantly refuse to work when the temperature is over 100 F. I've done it when I had to, and I can report that mixing epoxy fumes, fiberglass dust, protective clothing, and liberal doses of irritant-laden sweat is no fun whatsoever. However, I can report that at least something is still getting done. 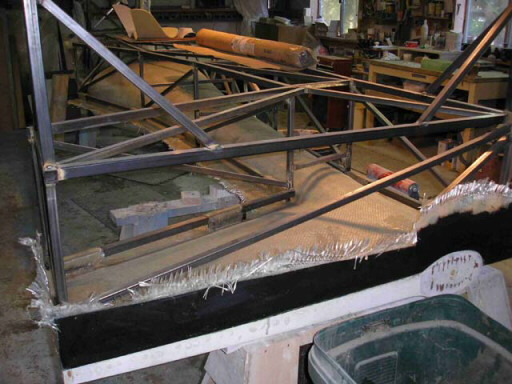 HP partner Brad Hill has bonded the steel truss onto the right side mold shell for the Glidair fuselage. 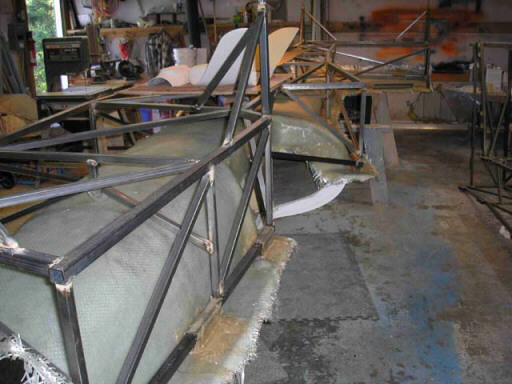 He's also made good, no, great progress on the winglet plugs and the plug for the pneumatic tailwheel. 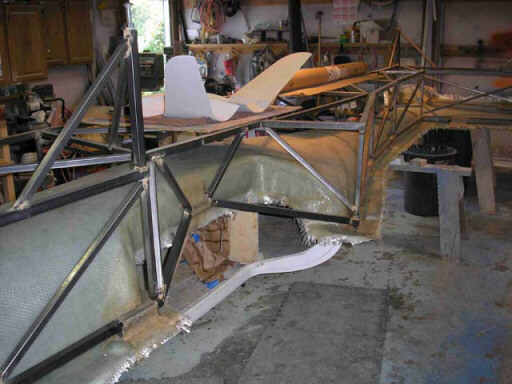 Also, I am making good progress here at procuring a new epoxy resin system for future parts of the project, including flight article parts. What we're working towards is a resin system that's basically equivalent to MGS 285. I've used MGS 285, it has many good properties and I like using it, but it is very expensive. Knowing as I do that epoxy chemistry is extremely well understood, and that almost all epoxy formulations are made from the same dozen resins, hardeners, and modifiers, it grates on me a bit to pay $87/gallon for stuff I know cost about $18/gallon back at the Epon and Epicure taps. But, hey, that's just me - I'm kinda crazy that way. 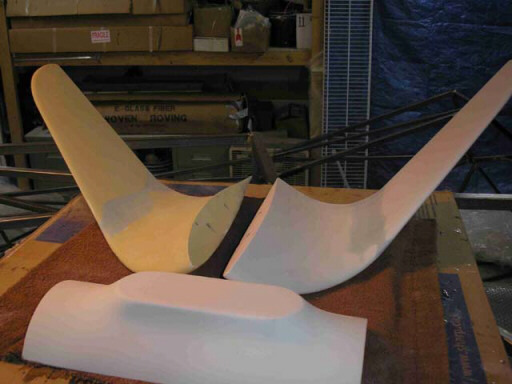 The next thing for me to get done is to pull a couple of moldings of the left and right wingtips to send to Brad so he can fair in the winglet plugs to match. That'll make those parts easier for the kit builder to apply. We'll try to get that done in the next couple of weekends. I might even try doing the parts after sundown, when the shop cools off a bit.